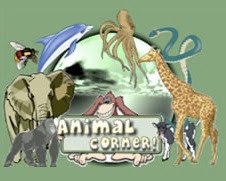 Animal corner is a website that will certainly appeal to the animal lovers in your classroom. It is the place to meet the animals of the world. The website is graphically attractive and it includes many data sheets about various animals in different categories : wildlife, reptiles, pets, insects, farm animals, marine life, rainforests and Galapagos Wildlife. Students aged 9-14 will find texts that are not too difficult to read with many pictures. It is the perfect resource for students doing a research project about an animal. Some of the animal described includes : cats, dogs, guinea pigs, hamsters, mice, camels, elephants, gorillas, hippos, lions, rhinos, zebra, ants, centipedes, bees, wasps, beetles, worms, sheep, pigs, cows, horses, crabs, dolphins, penguins, seals, sharks and whales. November 1, 2011 at 11:26 p.m.